I recently had the opportunity to help with test flights and engine break-in on the 91X-Ray Backcountry STOL Project. Our mission was to fly a designated route at very specific engine power settings for designated times. 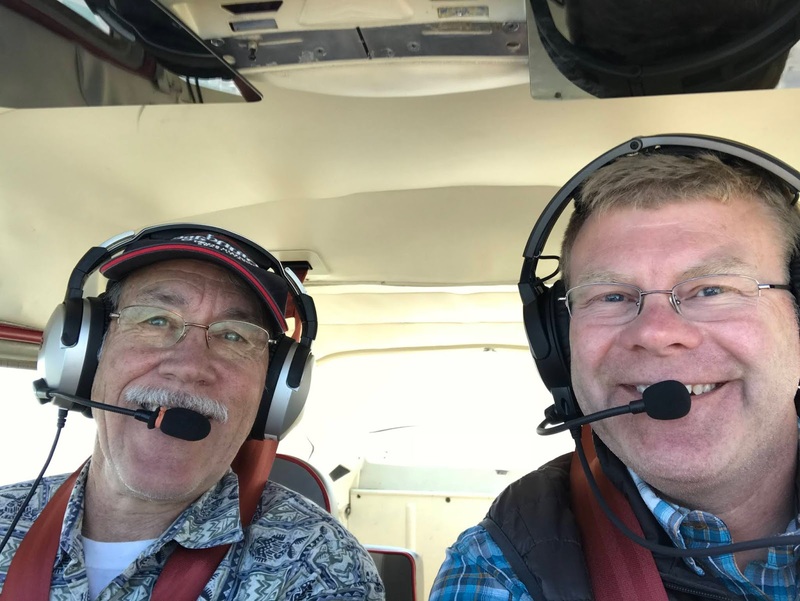 It was very important that we were always within gliding distance of an airport since the engine had nearly zero time on it and we were basically test pilots making sure the A&P's and engine manufacturers were holding up their end of the bargain. 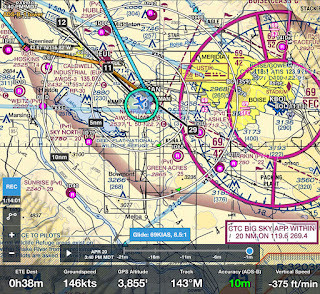 We used basic pilotage and dead reckoning for most of our flights but we also used some new technology including Foreflight's "Glide Advisor" to make sure we were always within gliding distance of an airport. 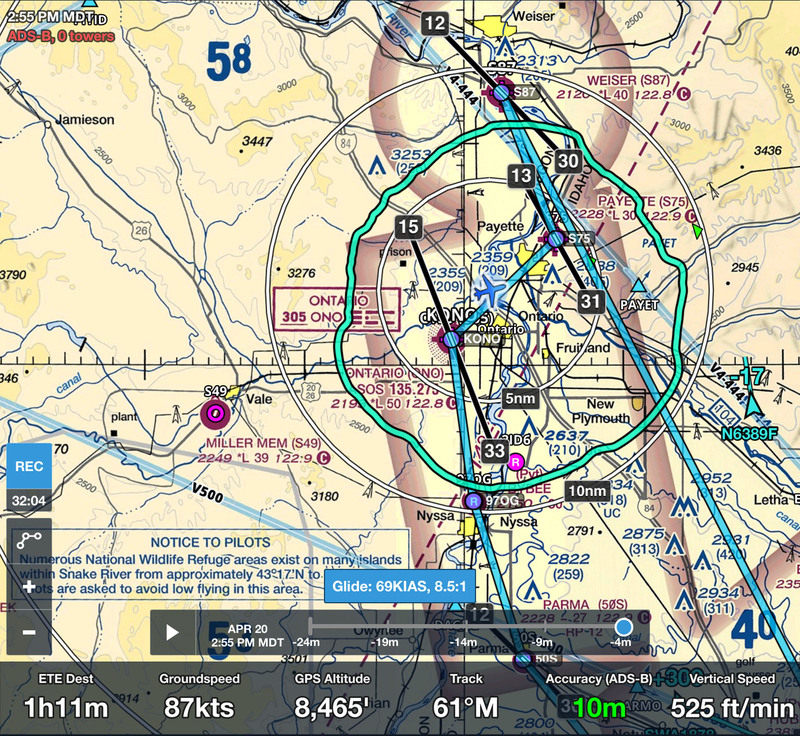 The POH for the 182H shows a glide ratio of 9.1:1 but I bumped that down a bit just to make sure we were able to make it to surrounding airports based on our best angle of glide speed using the Glide Advisor area ring. The ring takes into account wind speed and surrounding terrain. Our airspeed indicator in 91X is in mph so using 80mph as our best angle of glide gave us a 69kias glide which provides us a conservative 8.5:1 ratio. Here are some screen shots from our flights showing the differences of glide areas based on our altitudes. They always say "Altitude is a Pilot's Best Friend". This gives you some proof. Look at the available glide area when we are down low near traffic pattern altitude vs. when we are up at higher altitudes. When between Ontario and Payette at 8,500' we were almost within gliding distance of 4 different airports and near the 10mile radius ring due to the winds. 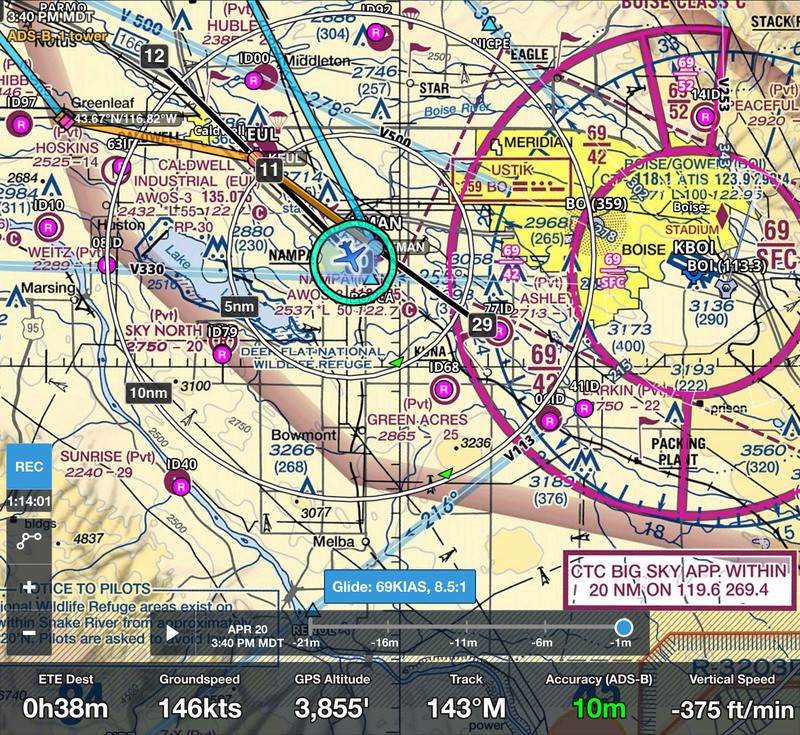 When nearing traffic pattern altitude near Nampa our gliding distance is only about 2miles. Nearly 10mile Gliding Distance from 8,465 feet. This gives us easily 2 airports to glide too. We ended up climbing to about 10,000ft and had 4 airports to choose from at that altitude. Near Traffic Pattern Altitude we are only able to glide about 2miles. We are within 1 mile of the airport but this shows how minimal altitude really limits your landing options. And...Before you ask if this Groundspeed is correct, Yes, it is :) We had a very strong tailwind and were required to operate at nearly full power for engine break-in so entering the traffic pattern at 168mph / 146kias can be a little tricky. We figured out later it was better to come in well above traffic pattern altitude & then decend into the traffic pattern after we had established traffic volume and location of other aircraft in the vicinity. © 2017 - Architecture by Air - . Picture Window theme. Powered by Blogger.